A few minor additions can make a big difference in some often overlooked and dark spaces. Toekick and cove lighting instantly give a more upscale look to a room. 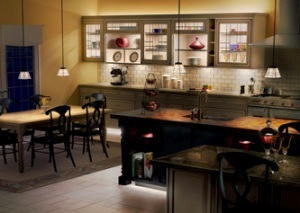 And, in a small kitchen, this type of lighting will give the illusion of more space. The best toekick and cove light sources are fluorescent, xenon and LED, because they are more energy efficient and incur less maintenance than incandescent. However, placement is key. It is most effective to put the light source as far away from the wall as possible to provide the most even illumination. LEDs are perfect for lighting inside and under cabinets, because of their very small size. LED strips can measure less than a half-inch wide and produce almost heat. For inside glass-door cabinets, LED downlights inside add visual drama without excessive heat or UV rays. Undercabinet lighting should be a priority for any kitchen, regardless of budget. It provides multiple benefits that cannot be achieved with overhead lighting. When working at a counter, the general lighting is typically behind the user, which creates a shadow that can only be alleviated with undercabinet lighting. In addition to LEDs, fluorescents are also very effective for lighting under cabinets. Don’t get caught at the office wearing one navy sock and one black one. Illuminating a closet properly is crucial. Incandescent light does a poor job differentiating between these very similar colors and it’s extremely hot. With the development of compact fluorescent lights (CFLs) and light-emitting diode (LED) bulbs, the use of incandescent and halogen in closets is less prevalent. CFLs can be a good choice when lighting a closet, but be sure to select a bulb with the right color temperature and rendering. It’s best to buy the 3500K color temperature lamps, which are very neutral and provide excellent color rendering across the color spectrum. LEDs are also a popular choice for closet lighting. In a shallow closet, place a linear LED above the door for broad and even light distribution. In larger closets, it’s more effective to use a surface-mounted or close-to-ceiling fixture using either CFLs or LEDs.